Assuming European politicians can’t get their act together enough to craft a reasonable Brexit deal that works for both sides by March 29, 2019 Europe will be faced with Brexit on WTO terms which is known colloquially as a ‘Hard Brexit’ where the UK would leave the European Single Market and Common Market mechanisms and other EU agreements and institutions without any subsequent deal in place. Without further ado, and without boring you with statistics, let’s look at how a Hard Brexit would play-out in the months and years following a WTO-style Brexit. Will There Be Famine in the Land? Of all of the dubious claims by the Project Fear campaigners (and they’ve made many!) this must rank in first place. No. There won’t be famine in the UK on account of Hard Brexit. However, you may notice your favorite brand of cheese may be unavailable for a time and you may find your prescription medications come from UK pharmaceutical companies or American pharmas instead of from continental Europe. Regarding agriculture; The United States agricultural belt is unimaginably massive and its farmers and ranchers are just waiting to fulfill the UK’s orders. There are fields of crops in the United States larger than the entire United Kingdom. 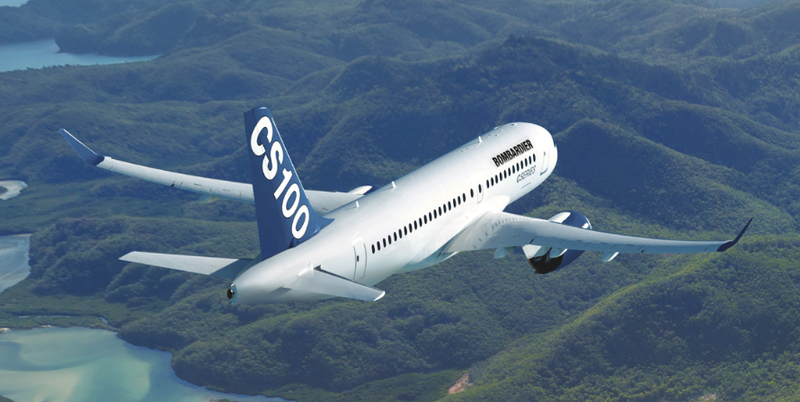 It takes 3-hours to overfly them in a jet aircraft flying at 500 miles per hour. Regarding ranching; There are 93.5 million cattle in the United States (2017) and that number continues to rise at a little better than 1% per year, and significant capacity exists to raise it over a relatively short period of time. 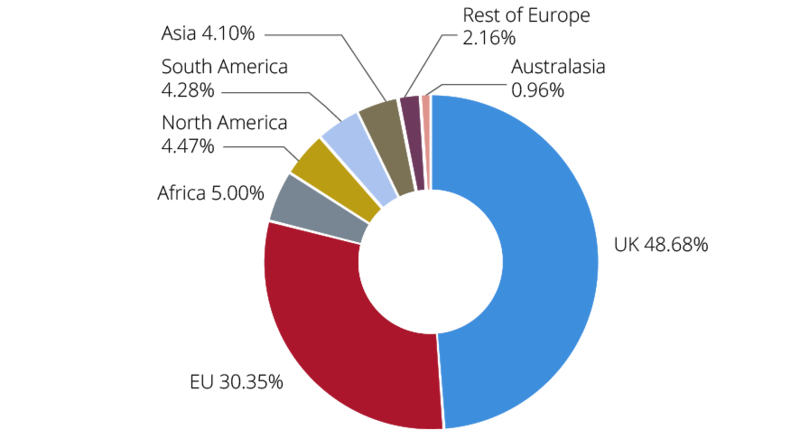 Similar agricultural capacity is available in Canada for grains, corn, soybean, and other crops, and Canada boasts 4.6 million cattle at present (2018) and Canada has more arable land than the United States allowing it to exceed even the mighty U.S. in this regard if sufficient firm orders were placed. To answer the question: “Where’s the beef?” It’s in the United States and Canada… Just pick up the phone and call us! North American farmers and ranchers would love to take your money — instead of the EU taking your money. Britons might find their food costs plummet as the huge economies of scale that typify North American food production and the favorable growing conditions combine to produce bumper-crop after bumper-crop which lead inevitably to lower food prices. Aren’t All American Crops GMO? Genetically Modified Organisms or GMO crops are grown on every continent, including Europe, which has about the same number of GMO crops as America. Some Europeans fear that all crops grown in the United States are GMO crops, but except in the case of corn that isn’t true. All corn, no matter where it is grown in the world is GMO and that’s been true for a few decades now. Corn (and maize, which is a type of rough corn that is fed to cattle over the winter months) aren’t commercially viable crops unless the GMO component is added. Some crops like ‘Yukon Gold’ potatoes, Canola (a seed grain) and every apple sold on the planet have been GMO for many decades. To alleviate concerns about GMO foods being sold in the UK, Theresa May’s government could simply legislate that any produce or meat that *isn’t* GMO must be identified as non-GMO for UK consumers. Explainer: Forcing producers to put GMO labels on their produce (if theirs is indeed a GMO variant) is seen as a negative by GMO food producers. But giving non-GMO farmers the right to advertise “Non-GMO produce” or “Non-GMO meat” on their labels would be seen as a positive for their non-GMO produce and meat. Not only won’t there be famine in the land, UK consumers will enjoy a completely new supply chain from which to choose and sufficient labelling for them to make the best choices for their families. What if the EU Decides to Punish the UK for Leaving? If the EU wanted to drive the UK directly into America’s arms… the EU would ensure a Hard Brexit and not allow EU goods or produce to be shipped to the UK following Brexit, nor would it allow UK goods or produce to be sold into the EU following Brexit. If that’s the EU plan, bring it on! Because that plan has a 100% chance of success should the EU choose to make it happen. And Americans and Canadians are just waiting… “Please, oh God, please, cause the EU to drive the UK into our ever-loving arms!” said every North American farmer, rancher and manufacturer. To say nothing about the even more fervent prayers being said by North American auto manufacturers in Detroit, U.S.A. and in Windsor, Canada. For Britain, a WTO Brexit simply means changing suppliers — with a zero-tariff trade deal in effect with North America — combined with the opportunity to sell UK goods into the vast North American market. The ball, as they say… is in your court, European Union! View the video where HM North American Trade Commissioner is interviewed by Bloomberg Television on March 26, 2018. Clicking on the image takes you direct to the relevant Bloomberg webpage. 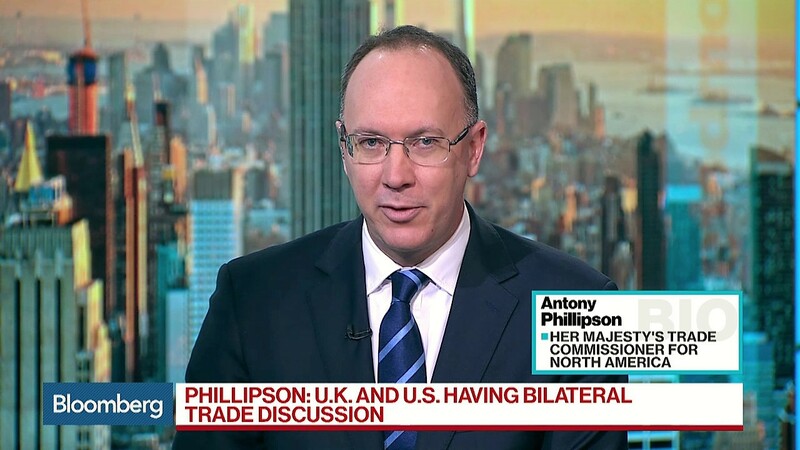 Antony Phillipson, HM Trade Commissioner for North America on Bloomberg TV.